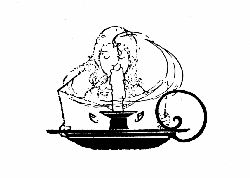 The Project Gutenberg eBook of Christmas Light, by Ethel Calvert Phillips. Far out on Judah's hills the night is deep. O little one, O Lord of Glory, sleep! Love's heart shall be the pillow for Thy cheek. Not yet for shelter vainly must Thou seek. Rest, little one, so mighty and so weak. O newborn Life, O Life eternal, sleep! IT was in a little garden in the village of Bethlehem, many and many a year ago, that four scarlet poppies stood side by side and swayed gently back and forth upon their slim green stalks in the soft afternoon wind. A little girl came running over the grass and halted before the poppies. "How beautiful you are!" said the little girl, whose name was Naomi, and who was eight years old. She clasped her hands before her in delight, and stood smiling down upon the flowers that seemed to nod courteously in reply. This little Jewish girl had dark curling hair and gentle brown eyes. Her cheeks were as rosy as the poppies, and she wore a gay little robe of scarlet and yellow striped stuff, while upon her bare brown feet were tied soft leather sandals. "How beautiful you are!" said Naomi again to the poppies. "You are mine, for I made you grow, and you are the most beautiful flowers in all our lovely garden." And she looked as proudly round the tiny garden plot as if it were as spacious and as wonderful as the famous gardens[Pg 3] of the wicked King Herod, or even those of the Temple High Priest himself. In the center of the grass plot stood an orange-tree, and under it, in the shade of its glossy leaves, had been placed a light wooden bench. A tall hedge of prickly thorns prevented passers-by on the narrow village street from peeping in. At one end a heavy grapevine clambered over a trellis, while at the other there were several rich clumps of myrtle that showed dark against the surrounding grass. Below the thorn hedge stood a row of bold flaunting tulips, and there were two flower-beds, one of white, the other of tall red lilies. The garden was indeed a pleasant place, and Naomi's happiest hours were spent here, whether playing peacefully alone, or amusing baby Jonas, or when the family gathered together under the orange-tree, Father and Mother, brother Ezra, baby Jonas, and herself. To be sure there were vines and flowers growing on the roof of Naomi's house, which was often used as a place to sit in the cool of the day and even to sleep when the house grew unbearably warm. For Naomi's dwelling looked like nothing so much as a square box turned upside down with only a door cut in the front and not a window to break the smooth white sides. Within, there was a single room, round which ran a bench where were kept the gay quilts, tightly rolled, which made the only beds Naomi knew. Here, too, lay the cushions upon which the family sat when at meals round the table, which was then pulled out from the wall. There was a great carved chest in which were kept the Sabbath clothes, the crescent of coins which belonged to Naomi's mother and which she wore upon her head as an ornament on festive occasions, and the long parchment rolls of Scripture in which[Pg 5] Naomi's father took the keenest pride. At the door stood a tall water-jar with herbs floating on the top to keep the water cool. In a niche in the doorpost hung a small roll of parchment in a case. Naomi was used to seeing her father and his friends touch it reverently when passing in or out, and then kiss the fingers that had touched the Name of the Most High. She could even recite as well as Ezra the verses she knew were written there, beginning, "Hear, O Israel: Jehovah our God is one Jehovah," and ending "and thou shalt write them upon the doorposts of thy house and upon thy gates." In a small building near by stood the oven where Naomi's mother did her baking and which she used in common with several other families. It was often a meeting-place for the children, who hung about the door on baking-days hoping for hot crumbs—stout Solomon from[Pg 6] across the road; Rachel and Rebekah, Naomi's particular friends; little Enoch, who walked with a limp and who would never grow any taller, though he might live to be ever so old. "I would that my Aunt Miriam used our oven," Naomi often thought, "for she bakes every day, and, oh, such good things as she makes." Naomi's aunt kept the village inn or khan that stood just outside the city gates on one of the little hills upon which Bethlehem was built. Many travelers stopped the night at the khan and even longer, for the village lay only one mile to the right of the great road which led from Jerusalem, six miles away, to the old town of Hebron, and then down into the far-away, mysterious land of Egypt itself. Where the road from Bethlehem joined the Jerusalem highway stood the tomb of Rachel, and many a time had Naomi,[Pg 7] loitering in the courtyard of the inn, heard pious pilgrims, fresh from the spot, tell the stories of Rachel and Jacob, and their sons Joseph and Benjamin. Naomi's little head was packed full of the stories of the great people of her race. Ezra, eleven years old, went to school in the synagogue every day with the other boys of the village, and diligently studied the Law and the Prophets. At home, Naomi was taught by her mother, not only the care of the house, but the history of the Hebrew people, their songs, their prayers, and their hopes. "I know ten hymns without a mistake," Naomi would boast, and by hymns she meant what we call psalms. "I can recite the Song of Deborah and the Song of Hannah. I can tell all the story about them, too, and, oh, ever so many more." Her favorite story was that of the Naomi for whom she had been named. [Pg 8] But this summer afternoon she was thinking of nothing save of the pretty blossoms that now swung before her after so many days of patient toil and care. She caught sight of her mother in the doorway and eagerly called her to come and see the sight. "Come, Mother, come," she called. "My poppies are all out, every one. Four of them in a row! See—even the smallest one that I feared would not bloom at all. There is one for each of thee: Father, Mother, Ezra, Jonas. The smallest one is for Jonas, and verily it is the prettiest one of all." Naomi's mother came smiling down the path. She carried a water-pitcher or urn, and astride her left shoulder sat baby Jonas, steadying himself by clutching his mother's thick dark hair. "The flowers are beautiful, Naomi," said she pleasantly. "They well repay[Pg 9] thee for all thy patience and care. I go now to the fountain for water. It lacks but half an hour to sundown. Watch thy little brother Jonas well and keep him happy until I return." And slipping Jonas from her shoulder to the grass, and pulling her white linen veil into place, she stepped quickly out into the village street, her urn securely balanced upon her head. Jonas had already crept over to the bench, and, dragging himself up upon his unsteady legs, he looked into his sister's face with a smile. "The smallest poppy is thine, Jonas," Naomi told him, "but thou must touch it not. Come now with me and see the pigeons." Behind the house, a step out of the garden, stood a dove-cote made of mud. Inside were two wide-mouthed earthen jars that served as nesting-boxes. The[Pg 10] pigeons were stepping majestically about on the ground, the sun touching their soft gray feathers with blue and green and rose. Jonas made several lunges at them in the hope of capturing a new plaything, but he succeeded only in stubbing his toe and sitting down hard upon the ground. "No, neither must thou touch them," said Naomi, helping him tenderly to his feet and brushing off the dirt. "It seems to me that there are a great many things that thou must not touch. But I know something that thou canst do. It is my secret, but I do not mind telling thee because thou canst not talk. Thou mayst help me dig a well!" Naomi's voice sank mysteriously as she guided the tottering Jonas back into the garden and over to a bare spot of ground behind the largest of the myrtle bushes. "Sit ye down, Jonas," said Naomi,[Pg 11] sinking cross-legged to the ground. "I mean to dig the well here, it will be so handy for Mother. Then never will she have to walk down to the fountain unless she likes. You take that stick and I will use this one." For a few moments the little girl worked industriously, loosening the dry sun-baked soil, while Jonas scratched vigorously with his sharp-pointed stick. "It is hard work, Jonas," sighed Naomi, pausing to shake back her curls. "But it will be worth it when once the well is made. It will be called 'Naomi's well' for me, and years and years from now my great-great-grandchildren will be proud of me because I made it. And when I am an old woman, all thin and brown and dried-up like lame Enoch's grandmother, I will say to my grandchildren, all standing round and listening to every word I say—I will say, 'Grandchildren, I well[Pg 12] remember the day thy dear uncle—that is thou, Jonas—and I dug this'—Oh! Oh!" And Naomi screamed aloud and jumped to her feet. Something cold and wet had been placed against the back of her neck, and little shivers were running over her as she turned and saw her brother Ezra behind her, smiling at her fright. In his arms he held a small white lamb, and it was this little animal's nose that had been pressed to Naomi's neck, and that had brought her day-dreaming to such an abrupt close. "Wilt thou not tell the grandchildren anything about their dear Uncle Ezra?" inquired Ezra with a comical look. "Who sharpened those sticks for thee, I would fain know, and thou didst not even tell me what use they were for. How dost thou think the grandchildren would like to hear that?" "How unkind thou art to listen and then laugh at me," said Naomi, putting out her under lip. "I would have told thee, Ezra, about the well only it was a secret. Do not tell Mother, wilt thou? I would fain surprise her. Promise thou wilt not tell, Ezra! Promise!" And Naomi laid an imploring hand upon her brother's arm. Ezra's only answer was to laugh and shake his head. Though he had no intention of telling, he wanted to tease Naomi a little before making any promises. He was fond of his little sister, and was far more gentle and kindly than many another brother would have been in those days in old Palestine. For in the Jewish family, girls were not valued so highly as boys, and were made to feel their unimportance in many ways that would be highly displeasing to little sisters of to-day. Girls were taught[Pg 14] to wait upon their brothers and to treat them with respect. It was impressed upon them that the duty of a girl was to be useful and modest and quiet, and that her chief pleasure should lie in making home happy and comfortable for her father and brothers. But in the household of Samuel the weaver, Naomi's lot had not been quite that of the ordinary Jewish girl. Her father was proud of his bright, lovable little daughter and had made her his special pet. Her mother, who had been well taught by her own mother, a "wise woman" of her day, was careful that Naomi seldom missed the daily lesson that kept the little girl, to her great delight, only a short way behind Ezra on the hard road of knowledge. So Ezra, though he felt his superiority as a boy and the first-born of his family, could not long resist Naomi's pleading[Pg 15] glance nor the pressure of her little brown hand. "What wilt thou give me if I do not tell?" asked Ezra, not wishing to seem to relent too quickly. "The first bright shekel I find in the highway," answered Naomi saucily. She was smiling now, and her hand was gently stroking the little lamb's nose. "What lamb is this, Ezra?" she asked. "And why hast thou brought it home? It seems sleepy, poor little creature. Look, its eyes are half shut." "It is one of the Temple flock," answered Ezra, looking down at the quiet little animal in his arms. "But it has a blemish. It runs on three legs, and it does not see very well. They will not keep it in the flock—it is not fit for Temple use—and shepherd Eli gave it to me this afternoon for my own. I helped him find an old ewe that had caught her foot [Pg 16]between two stones, and when I was leaving he gave me the lamb." By the "Temple flock" Ezra meant the sheep that were destined to be used as sacrifices in the great Temple at Jerusalem, and which were encamped all the year round on the hills outside the city. The shepherds of the flock were friendly to the boy, who declared he meant when a man to be a Temple shepherd himself. Ezra spent most of his spare time with them, helping them in their work and listening with delight to their thrilling stories of encounters with wolves and jackals. Many of the shepherds were friends of his father, for both were connected with the Temple, since Samuel the weaver spent his days, in common with a number of others in Bethlehem, in making the gorgeous curtains and veils that were used in the sacred building. "Stand up, Three Legs," said Ezra,[Pg 17] putting his lamb on the ground and showing Naomi its pitifully shrunken limb. In naming it "Three Legs" Ezra was following the custom of the shepherds who called their charges by any peculiarity they might possess, such as "Black Ear" or "Long Tail." "I mean to make a little wagon and teach Three Legs to draw it. And if he is not able to do that, I shall sell him for whatever I can get." "Oh, no, Ezra," said Naomi whose tender heart was touched by the forlorn little animal. "He is sick, he is not able to draw a wagon. Give him to me and let me take care of him." "I will sell him first," said he with determination. "I will not give him away." "Sell him to me!" cried Naomi; "sell him to me!" The lamb had toppled over in a little heap and was looking patiently and with[Pg 18] half-closed eyes into Naomi's face bent above him. It seemed to the little girl that she would gladly give her dearest possession if she might have the lamb for her own to nurse and care for. "Sell him to me, Ezra. I will give thee anything thou mayst ask." "What hast thou to give?" asked Ezra shrewdly. He felt sure the lamb could never draw a wagon, and the prospect of selling a sick animal was small. "Anything thou mayst ask," was Naomi's reckless answer. The lamb had put out a limp pink tongue and was licking her fingers. Ezra had heard his aunt say that very day, "I need poppies sorely for my brew for the palsy, and not a single one has bloomed in the khan garden this year." Surely four poppies would be worth a[Pg 19] rich cake or two, or perhaps even a piece of money. "My poppies?" Naomi looked aghast. "My poppies? All four? Why, there is just one apiece! Father and Mother, thou and Jonas! My poppies?" The lamb stirred and with a little sigh of content snuggled his nose into the palm of Naomi's hand. "Take them!" Naomi stood up and gathered the lamb in her arms. "Take them, only let me not see thee." She turned her back upon Ezra and shut her eyes. Quickly he gathered the flowers and ran out of the garden. Naomi opened her eyes. She gave one look at her despoiled flower-bed and bent again over the lamb. "I am glad, Three Legs," said she warmly. "Thou art much better than many poppies, thou poor little creature, and I am glad I did it. I am glad!" IT was Sabbath morning, and Naomi and her mother and Ezra were on their way to the synagogue. They chose back streets as they went, and they met only women and children on their way, for the front roads on the Sabbath day were given up to the men. Naomi was happy as she walked quietly along holding fast to her mother's hand, for she wore her new hyacinth-blue robe that her mother had spun and her father had woven for her. "In two years' time I shall be a Son of the Law, and then I shall sit on the men's side in the synagogue, and walk on the front streets on Sabbath. Thou and Mother will have to come alone." "Jonas will walk with us then," she whispered back. "Boaster!" She did not really blame Ezra for his lordly words and air, for she knew how every Jewish boy looked forward to what was called his Day of Freedom, when by a priest in the synagogue he was made a Son of the Law. Then he would be no longer a child, but a young man. His school days would be over. He would choose a trade and begin to earn his own living. But it was a comfort to Naomi to think that, with Ezra gone, little Jonas would trot along by her side, and she was thinking of baby Jonas, left every Sabbath morning in the care of lame Enoch's old grandmother, now grown too feeble to climb the hill to the synagogue, when Aunt Miriam overtook them. Aunt Miriam's husband, Simon, was a[Pg 22] wealthy man in the village of Bethlehem. He was the owner of the guest-house or khan that stood a little below the town on the way leading down into Egypt, and which was believed to have been the dwelling of Boaz and Ruth, and the birth-place of King David himself. To-day Aunt Miriam wore a robe of fine linen, covered with a wide cloak of black and white stripes, and her earrings and bracelets tinkled at every step. On week-days the children knew her to be bustling and chatty and fond of a jest. But the Sabbath saw her a different woman. Stately and dignified she walked beside them now, her brown eyes gazing far away and full of holy thought. The children felt awed and shy with her as they might with a stranger. Ezra stopped his whispering. Naomi glanced timidly up, her head held sideways like a little bird. "How good Aunt Miriam is!" she mused. But her aunt's thoughts wandered for a moment from their pious meditations. Suddenly she loosened the veil that was pulled across her face and spoke briefly to Naomi's mother. "I shall come to see thee to-night after sundown. I go to Jerusalem to-morrow, and there may be room in the cart for a certain good little maid." Naomi's heart leaped. Did Aunt Miriam mean her? What other little girl might she take with her? But she had said "a good little maid," and Naomi remembered with a pang of regret how she and Ezra had quarreled yesterday, and had not ceased their bickering until at sunset the three blasts of the silver trumpet, blown by the priest on the synagogue roof, had reminded them that Sabbath eve had come. She longed to ask outright: "Dost[Pg 24] thou mean to take me to Jerusalem with thee, Aunt Miriam?" But they had reached the flat-roofed little synagogue, and once inside the gate the children silently followed their mother and aunt into the women's court and seated themselves on the mats that covered the stone floor. Naomi's mind was so occupied by the thought of a possible trip to Jerusalem that she forgot to peep, according to her wont, through the lattice that separated the men's court from that of the women, in the hope of seeing her father. She usually watched with interest while the sacred Rolls were taken from their curtained shrine, before which burned the holy lamp, and their outer cover of gold-embroidered silk and inner cover of linen removed. But this morning she scarcely heard the voice of the visiting rabbi who read[Pg 25] the lesson for the day, and her mother was obliged to twitch her vigorously when, during the prayers, the congregation rose to their feet and turned toward the Holy City. The Sabbath day seemed endless to the eager little girl. All work and play were forbidden. No fire might be lighted, no bed made. Naomi had been well taught in the Law. She knew that it would be sinful for her even to carry a handkerchief tucked in her belt. And so surely not until Sabbath was over would the trip to Jerusalem be discussed. 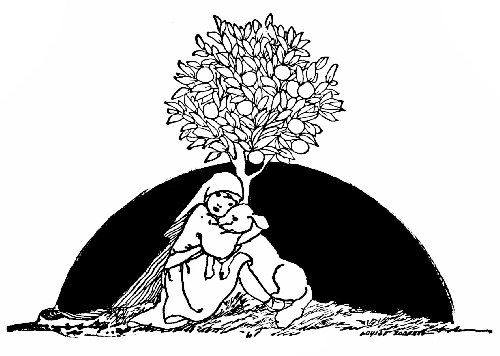 She sat alone in the shade of the fig-tree that grew beside their door, and wished that she might see her friends Rachel and Rebekah to tell them the good news. She watched the great sun flame through the bright Syrian sky until her eyes burned and ached, but still it was not sundown. At last she curled[Pg 26] herself up on the floor of the house with heavy-eyed Three Legs at her side and fell asleep. When she woke it was the First Watch of the Evening, six o'clock, and the crimson sun was sinking out of sight behind the Judean hills. Naomi sprang up and ran into the garden. There on the bench under the orange-tree sat her father and mother and Aunt Miriam. "And so, since Simon is still sick with a heavy summer cold, nothing will do but I must ride to Jerusalem to-morrow with the load of grapes," she was saying. Simon had large vineyards and owned many olive-trees, beside being host at the inn. "To be sure, Jacob is a good serving-lad and manages well without his master. But there is no one, after himself, who makes a better bargain than I, Simon says, and so I must ride with the[Pg 27] fruit to see that justice is done my lord Simon in the trade." "And what does the physician say of Simon?" "He recommended that he kiss the nose of a mule," Aunt Miriam answered gravely. To her and to her audience there was nothing amusing about this prescription. Stranger remedies than that had been ordered by the wise doctors of the day: a broth of beetle's legs, crab's eyes, the heads of mice, bruised flies to cure the sting of a hornet! "But in spite of this," she continued, "he is still flat on his back, groaning with aches and pains. So, to-morrow, Jacob and I start at sunrise with the bullock cart, and no doubt there will be room among the baskets of grapes for Naomi, if thou wilt permit her to go." Naomi, at her father's elbow, glanced imploringly into his face, but she did not speak a word. Her mother, from the end of the bench, smiled hopefully at the little girl, but she, too, waited in deferent silence until, to Naomi's great relief, her father gave a nod of consent. "It is kind of thee, sister Miriam," said he, putting his arm about Naomi and drawing her to his side, "to think of giving our little daughter this pleasure." "Naomi must be good and obedient and not make herself troublesome in any way," said her mother warningly, leaning forward to pull Naomi's little robe straight. [Pg 29] "Thy aunt will be occupied with her business, Naomi, and thou must be as quiet as a mouse so that she will not regret that thou art with her." "Never fear that," said Aunt Miriam heartily, "Naomi is as dear to me as my own. I shall not be so busy that she will have to play mouse all day. She shall see something of the city, and eat a good dinner at the house of Simon's sister Anna, and make friends, perhaps, with Anna's little Martha who is just her age." "I will be quiet," promised Naomi, her face bright with smiles. "I will be good. I will not speak a word nor stir all day long." "Great are thy promises, Naomi," answered Aunt Miriam, rising to go and laying a kindly hand upon the curly head of her niece. "I will give thee a hot breakfast at the khan to stay thee on thy journey, so be not late. We start at sunrise!" "Oh, Father," cried Naomi, throwing her arms about her father's neck, "how good I mean to be always after this! Dost think I shall see the Temple? And, Mother, which am I to wear—my new blue robe or my yellow and red striped one? I am really to go to Jerusalem! Oh, what will Ezra say when he hears the good news I have to tell!" The next morning at daybreak, when the purple shadows lay heavily in the east and the sky was still gray overhead, Naomi, wearing a gay little cloak of scarlet over her best blue robe, ran hastily down the stony road that led to the Bethlehem khan. The drowsy gate-keeper had already unlocked the heavy town gates, for day begins early in hot countries, and at sight of Naomi, whom he knew well, he uttered a sleepy "Peace be with thee!" as a morning greeting. "With thee be peace!" piped Naomi in return. "Oh, Nathan, I go to-day to Jerusalem with my Aunt Miriam. This very day I go!" Old Nathan nodded his head solemnly and muttered in his beard. "Beautiful for situation, the joy of the whole earth is Mount Zion," responded the pious old Jew. But Naomi was half-way down the hill and did not hear one word. There before her at the crossroads stood the old khan, with its great wall of stone and its stout gate behind which all night long sat a watchman on the alert. Below the inn lay the very fields among which Ruth, long, long ago, had gleaned the golden corn, and where later King David as a shepherd lad had tended his flock. Naomi slipped through the open gate into the courtyard of the khan and stood for a moment watching the bustle and[Pg 32] confusion of the scene before her. In the center of the court was the fountain, and round it now crowded the pilgrims and travelers, drawing water for the morning meal or in which to wash before eating. The archways which lined the wall formed the rooms of the ancient inn, for the building at the end of the court in which Simon the host and Aunt Miriam lived was not open to strangers. Shelter and food were not provided within. Each man in his little archway must spread his own carpet, light his own brazier, cook his own food, and eat from his own dish. A Syrian khan of that period was not at all like the inns of our day. It was expected to supply nothing but water and straw for a bed. It was a refuge from thieves and wild animals, a shelter from heat and dust, a spot where a trader might sell his wares. Naomi looked with interest at the patient camels already kneeling to receive[Pg 33] their load, perhaps of precious ointment or sweet spices. Here were the merchants spreading their wares: gold work from Cairo; shawls of Tyrian dye, royal purple or scarlet; rich perfumes in their vases of alabaster, large and small. In one corner a group of dogs, snapping and snarling, quarreled over a bone. A caravan was starting for Egypt, and as the Bethlehem khan was the first night's rest after leaving Zion, many friends of the travelers had come with them from Jerusalem and were now sorrowfully saying their last farewells. Naomi stood watching an old father tenderly kiss his departing son upon either cheek and then lay his hand upon the boy's head in blessing. A little lad, carrying his pet monkey, was lifted to the back of a camel, and Naomi was staring so intently that she did not see the serving-lad Jacob until he was close upon her. "Thy aunt calls for thee," said he to Naomi. "The cart stands ready loaded and we start as soon as thou hast eaten." "I would that we were going down into Egypt, Jacob," said Naomi, skipping toward the house as she spoke. "To ride to Jerusalem is nothing. We shall be back to-morrow in this very spot." "Aye, if the robbers do not catch us," answered Jacob, wagging his head wisely. It was the first time he had been trusted to ride to Jerusalem with a load, and the responsibility weighed heavily upon him. "Robbers? Aunt Miriam, will there be robbers on the way to-day, think you?" Aunt Miriam paused in her brisk stepping about the room. "Here is a bowl of hot pottage and a warm cake for thee, Naomi. Eat all of it," she commanded. "And talk not to me of robbers. In truth, there are as many robbers[Pg 35] in the khan at Bethlehem as upon the length of Jerusalem highway. The caravan to Egypt will pay for straw for six camels and ten mules, will they, when I myself counted no less than twenty animals in their train? Jacob, bring hither the leader of the caravan that I may talk with him. Robbers, indeed! Robbers!" Aunt Miriam's red cheeks and flashing eyes boded ill for the leader of the caravan for Egypt. Naomi ate her lentil pottage and munched her cake leisurely in a quiet corner, but she had long finished her meal when Aunt Miriam was at last satisfied and ready to start. The bullock cart stood loaded with baskets piled high with great bunches of purple grapes. Over them were spread the dewy green leaves of the vine to protect the fruit from the sun and to keep it fresh and moist. Aunt Miriam, with a sigh of relief, settled herself in place in the front of the cart. Naomi was tucked into a comfortable corner between two great brown baskets of woven rushes. Jacob, standing at the cattle's head, cracked his long whip, the animals strained forward, the cart wheels creaked and turned, and they were off for Jerusalem. THE road to Jerusalem stretched white and hot in the blazing sunshine. The deep blue sky was without a cloud, and the insects, hidden in the roadside grass, hummed in the heat. A cloud of dust in the distance told that the three Roman soldiers who, only a moment ago, it seemed, had galloped past the slowly moving ox cart, were nearing their destination, the Holy City. Naomi had watched the glitter of their helmets and the flashing of their bright lances with the same interest she had given to a string of melancholy gray camels led along the road by a country lad in his cool white tunic and broad red leather belt. Everything was interesting this morning to Naomi. She stared at the dusty[Pg 38] gray olive-trees, the shabby scrub oaks, the low-branched sycamores as if she had not been familiar with them all her life. To-day the birds seemed to dart about more swiftly and to utter sweeter songs as they flew. The few sheep she spied nibbling the sparse grass on the rocky hillsides were surely whiter than those at home. The field flowers, with faces upturned to the bright sun, glowed with splendid color. The whole world was glad to-day. "They are all happy because I am happy," mused Naomi, smiling at her own thought. She glanced at Jacob plodding contentedly along beside his beasts, at Aunt Miriam who sat silent, her usually busy hands folded in her lap, enjoying this little rest from her many household cares. Naomi peered about, and Aunt Miriam[Pg 39] sat up straight at this sound upon the road. Now the shuffling of cautious feet was to be heard, too. Down the Jerusalem highway came six men walking in single file, each with a staff in hand and the other hand resting upon the shoulder of the man before him. They were all blind! Even their guide, who tapped the ground as he walked, was sightless, "the blind leading the blind." Naomi stared curiously. She had often seen as many as a dozen blind men walking in such a row, and they were always to be found by the wayside or near the village gates at home, in company with the lame and the helpless, holding out a little bowl for money or food. She took a piece of money from her purse, securely fastened in her belt, and[Pg 40] Jacob, without being told, dropped it in the bowl of the blind leader. He was accustomed to the charity of his good master and mistress. Had not Moses the Lawgiver bade those who fear their God have sympathy for the blind? The blind men at sound of the cart had drawn up by the side of the road, and now they leaned upon their staffs and turned their sightless faces toward their unseen benefactress. They were glad of an excuse to rest and also to talk, for time meant little to them, and they liked nothing better than to recount, each one, the detailed history of his misfortune. "Peace be unto thee, friends! We hasten[Pg 41] on to Jerusalem before the sun mounts high. May all good things await thee in Bethlehem!" Up the steep hill climbed the bullock cart, and once round the curve in the road Aunt Miriam pointed. "Naomi—the City!" she said. "See the Temple! How it gleams!" "We have thought on thy lovingkindness, O God, in the midst of thy temple." To the pious little Jewish girl there could be no more beautiful nor inspiring sight than that of the sacred Temple set[Pg 42] in the midst of the Holy City. She kept a reverent silence until they reached the Bethlehem gate where entered all the trade and travel from Egypt and the sea. But once Naomi was lifted down from the cart, and placed in the shade of the huge gateway to wait with Aunt Miriam while Jacob justified their presence in the city to the haughty Roman guard, her tongue wagged on as merrily as before. 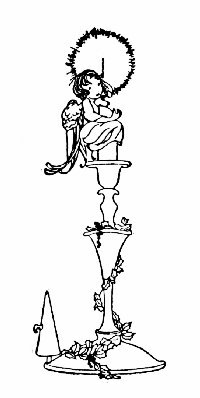 "We have no watch-tower like this one on our gateway at home, Aunt Miriam," she observed, glancing up and down and roundabout. "I suppose that ten soldiers could stand in this one at once if they liked." Her aunt nodded absently. Her thoughts were with Jacob, still talking with the Roman guard. She hoped there would be no trouble on this day of all days when Simon was not with them. "Wilt thou buy me a drink, Aunt [Pg 43]Miriam?" Naomi asked next. "Not of water, but of honey of wine." "Honey of wine! Who will buy? Honey of wine! Ho, every one that is athirst, come! Buy and drink! Honey of wine!" A moment later she had forgotten that she was thirsty and was watching two poor women who sat in a corner on the ground grinding at a stone mill. Near by stood a man selling the cakes new made from the meal the women had ground. It was hard work turning the handles that pressed the meal between the upper and[Pg 44] nether millstones, and the women worked wearily. "How slow they are!" said Naomi scornfully. "I could work much faster than they, could I not, Aunt Miriam? Could I not grind fast if I tried?" Naomi's aunt did not answer. With a gentle hand she pushed the little girl back against the wall. "Stand there, thou chattering sparrow," said she with a smile, "and hold thy peace. Here comes one Solomon the goldbeater, thy Uncle Simon's friend. The load of grapes was brought here at his order, and it is my task to-day to see that he offers a fair price for them. Peace!" It seemed a long time to Naomi that Solomon the goldbeater and Jacob the serving-lad, standing at a little distance from the wall, haggled over the load of grapes. But at last Jacob came to report to his mistress the sum offered, and since[Pg 45] she was satisfied the bargain was soon made. Then up they went through the narrow dingy streets with their overhanging houses that made a pleasant shade, past the quarters of the tinsmiths and the jewelers, the tailors and the sandal-makers. Naomi looked eagerly in at the gay bazaars piled high with fine linens and embroideries, rich scarves and veils, spices and coffee, dried fruits and nuts. On they went, past the street of the potters where anything might be bought, from water-jars as tall as Naomi herself to the tiny cup-shaped Virgin's lamps which, filled with sweet oil, were carried by the Jewish girls. "Look well about thee, child," instructed Aunt Miriam from behind her veil. "We shall not come this way again." "I can tell it all now to Ezra," [Pg 46]answered Naomi confidently. "I have not forgotten a single sight. So far I liked it best of all when the great Pharisee gave alms to the poor in the market-place just now, when we were waiting there for Jacob. I liked it when his servant blew upon the trumpet, and the poor came hurrying, and every one turned to look. And next best I liked the cages of sparrows for sale. We have them in the market-place at home, but not so many nor so fat. And next—"
"And next," interrupted her aunt with a smile, "thou wouldst like thy dinner, perhaps. Here is the home of Simon's sister Anna, and verily I believe her little Martha is watching for us through the wicket in the gate." Little Martha, with the help of the porter, threw open the gate before Aunt Miriam could say another word, and Naomi stepped through a passageway under[Pg 47] the house into a courtyard with a tiny fountain playing in the center and a palm growing on either side of it. Little Martha was as fair as Naomi was dark. She had light reddish hair and blue eyes, and well pleased was her mother that it should be so, for this was called "King David's coloring" and was supposed to have been that of the great King himself. She wore a soft little robe of white and a fine gold chain about her neck. She joyfully led the visitors to her mother who was waiting for them at the end of the court. "Come in, thou blessed of the Lord," was the gracious greeting Anna gave them, and she ushered them up the stairs and into a room that actually had two windows cut in the side. They were the first windows Naomi had ever looked from, and she held tight to the sill for fear of falling into the street below. "I would that I had windows in my house," thought Naomi ruefully. "I would be so proud if I were Martha. But then she has no brother Ezra nor baby Jonas to play with her." In spite of the windows little Martha did not seem at all proud. She helped her mother bring bowls of water for the guests to wash in, and when the meal was ready she patted the plump cushions into shape on the divans placed before the gayly painted table. "Sit by me," she whispered to Naomi, breaking off a neat three-cornered piece of barley cake which was to serve Naomi as knife and fork and spoon. For dinner there was a dish of young kid stewed with olives, hot barley cakes, fresh and dried fruit—apricots, figs, pomegranates—and a bowl of amber honey. Not an easy thing is it to serve one's self with neatness and dispatch without[Pg 49] knife or fork, and only one's fingers and a bit of bread to rely upon. But Naomi and Martha were able to dip their food from the common dish with a bit of barley cake quite as nicely as the grown people did, and they sat quiet and respectful while Aunt Miriam told of Simon's illness and the reason for this trip to Jerusalem. "Mother says we are all to go about the twelfth hour, in the cool of the day, to show thee the Temple and to see King Herod's garden. Oh! Oh!" And she squeezed her new friend's arm with such fervor that the pretty bowl was barely saved from falling to the floor. Later in the day when the first evening[Pg 50] breezes were drifting down the dark ravines that swept round the city, the little party of sight-seers slowly climbed the steep lanes that led toward Mount Moriah on which the Temple stood. Built of white marble and glittering with gold, it dazzled the eyes of little village-bred Naomi and made her heart thrill as she gazed up the flights of steps at the very House of God. It was a flat-roofed, oblong building, this Temple of the Hebrews, divided within by a curtain of the finest work into two great rooms, the Holy of Holies and the Holy Place. The Holy of Holies was the dwelling-place of the Most High, never to be trodden, never to be seen, except upon the rarest occasions, by mortal man. It was now bare and empty, since the loss years before, in the war with Babylon, of the Ark with its Mercy Seat and two golden cherubim. In the outer chamber, the Holy Place, lying to the east, stood the golden candlestick bearing seven lamps, the golden table of shew bread with its twelve loaves arranged in two rows, and the golden Altar of Incense, having thirteen spices burning night and day to signify that all the produce of the earth belongs to God. In the huge doorway of this room, where only the priests might enter, and facing the sunrise, hung a second curtain or veil of fine linen richly embroidered in blue and scarlet, purple and flax. These colors were meant to be an image of the world. The scarlet represented fire, the flax earth, the blue sky, and the purple sea. Along the wall ran golden vines and clusters of the grape, the typical plant of Israel. All this Naomi could picture perfectly so often had she heard it described, but she saw it with the eye of her mind only, for the women of Israel had a court set[Pg 52] apart for them many flights below the Temple building itself and at the east of the men's Court of the Israelites, as it was called. Martha stood at the little girl's elbow, gazing about, too, but not with the same eager interest that Naomi showed, since a visit to the Temple was no great rarity to her. "Thou shouldst see the Temple at Passover, Naomi," she murmured; "the crowds of people, and the priests at sunrise upon the walls blowing a thousand silver trumpets, and the long procession in the streets carrying the lambs for the offering." "Father hath promised to bring us all next Passover," Naomi answered happily. "But now I long mightily to see the great Altar of Burnt Offering in the Court of the Priests. It is made of unhewn stone, Ezra says, and there, too, stands the[Pg 53] bronze basin where the priests wash hands and feet before entering the Holy Place. Ezra has learned all about it at school. I long to see it." Little Martha shook her head. "Nay," she murmured reprovingly, "that is not a sight for me and thee. I have seen the smoke rising—that is all." Naomi stared up at the great group of buildings—courts, halls, cloisters, terraces, and walls, topped by the splendid golden front of the Holy Place, in silent awe. "If once I should lose sight of Aunt Miriam," she thought, "I might wander about here for days and days and never find her again." And she took such a firm hold upon her aunt's cloak that she, feeling the tug, thought the little girl was impatient to move on. "Yes, child, yes," said she. "We go[Pg 54] down now into the Court of the Gentiles. Do thou and little Martha walk on ahead. Pick thy way carefully, for this flight of steps is steep." The Court of the Gentiles was open to the men of all nations, since it was not strictly a part of the Temple. It was a sort of sacred market-place, and Naomi and little Martha, as they walked about, held tight to one another when they passed the pens of sheep and oxen destined to be burnt offerings, and which were restlessly shouldering one another and lowing and bleating as if in some way they sensed their approaching doom. Here the seller of doves and pigeons kept his cotes, for many a worshiper could not afford to buy a kid or a lamb. Here, too, were the booths and stalls of the moneychangers who did a brisk trade, since no coin might be offered in the Temple save the sacred shekel. "Art thou ready at last to leave the Temple, child?" asked Aunt Miriam, coming up behind Naomi as she stood gazing in at a penful of young lambs. "Wilt thou be able to tell all this to Ezra, think you?" Naomi nodded slowly. She was not listening to what her aunt said. She was wondering why at times the sheep looked so strangely blurred, and why little black specks seemed to dance before her eyes. "Over there is a little lamb that looks like my Three Legs, Aunt Miriam," said she. "I am glad he is not here, shut up in one of these great pens, and to die, perhaps, before another day." She moved listlessly along, and when her aunt took her hand she clung to her so heavily that good Aunt Miriam stopped short on the side of the hill. "What ails thee, child?" said she, bending over Naomi. "Thou art not like[Pg 56] thyself. Thine eyes look strangely heavy, even like those of little Three Legs. Art thou ill?" "Nay," said Naomi crossly. Surely to have sudden pains shoot through one's eyes was not to be ill. "I would see the gardens of King Herod. That is what I want." "The child is weary," said little Martha's mother kindly. "She has had a long journey to-day besides this visit to the Temple. The gardens of King Herod will wait for thee, Naomi, until another time when thou art rested. They will not run away." But Naomi would not smile at this little joke. She pulled pettishly away when good friend Anna placed her hand upon her forehead to see if she were feverish. "I would see the gardens of King Herod," she repeated plaintively, rubbing her eyes as she spoke. "Ezra saw[Pg 57] them, with rivers and flowers and fountains. He saw doves and pigeons flying through the air. He saw a great beast that spouted water from its mouth, and I would fain see it, too." The magnificent gardens of the King of Judea were open all day long to any one who wished to enter and enjoy their beauty, their coolness, and their shade. Canals flowed between green banks, flowers bloomed and trees rustled, fountains played in the sunlight, and tiny fish darted hither and thither in the artificial pools. But there, too, bright against the green, was to be seen the white marble of statues—nymphs, and dryads, figures symbolizing grace and beauty—and for this reason, since to him all statues were idols, no Jew would set foot within King Herod's garden. All that Naomi could hope to do, beside gazing at the three famous castles of[Pg 58] white marble, with their battlements and turrets, built by Herod the Great, and at his own splendid palace with its massive walls and towers, was to peep at the garden through the open gateways or perhaps from the top of the wall, as Ezra had done. "Carry the little maid home, Jacob. She is exceedingly weary and needs a night's rest." Naomi, without a protest, turned to Jacob and gladly hid her heavy, aching eyes upon his broad shoulder. "I am like Three Legs," thought Naomi, as the procession moved homeward. "But then Three Legs has been sick a long, long time, and I shall be well in the morning." "MOTHER, is it sunrise yet?" "No, Naomi, it but nears the end of the Third Watch." "Mother, does the lamp still burn?" "Yes, child, as always, on the table. Lie still, Naomi, and try to sleep. Thou hast a journey before thee to-day." "Aye," said the little girl, turning restlessly on her quilt. "I know, to the Pool of Bethesda. Perhaps I shall come home with opened eyes, Mother. Perhaps I shall see when I come home to-day. Dost thou believe that the Angel of the Pool will open mine eyes?" "Yea, child, I do believe," answered her mother earnestly. "Thou shalt see again. I hope it with all my heart." "And then I shall help thee once more[Pg 61] about the house," said Naomi hopefully, "and learn my lesson every day, and care for baby Jonas when thou art busy. Then I shall run and wait upon my father as of old, and he will place his hand upon my head and say, 'Naomi, thou art as quick and light upon thy feet as a young hart or doe.' That he cannot say now and speak the truth. But this very day it may be I shall have my sight again." And with this hope to comfort her, Naomi lay quietly down upon her bed and let her thoughts go back to her last trip to Jerusalem and its sad homecoming. She remembered the long ride in the jolting bullock cart, which Jacob guided as carefully as he knew how in order to spare Naomi's aching head and throbbing eyeballs. For the night's rest had not cured Naomi. She had awakened with swollen eyelids that were so heavy she could not[Pg 62] hold them up, and sharp little stabs of pain had caused her to moan and twist in the arms of kind Aunt Miriam who held her tenderly on the long homeward ride. Then came days and nights of pain, and a visit from one of the great doctors of Palestine who ordered poultices of earth mixed with the saliva of one who had been long fasting. And when Naomi could no longer bear the heavy weight of this remedy upon her tortured eyes, he kindly changed the poultice to one of owl's brains, as being not only more comfortable but a trifle quicker in its action. At last the day arrived when Naomi was free from pain, but when also, alas! as she raised her head weakly and looked about, she did not see the familiar room with its carved chest and gay cushions and little table pushed against the wall,[Pg 63] she did not see the loving anxious faces of her father and mother and Ezra, but only a black curtain dotted with blacker stars that danced and winked and danced again. "I cannot see thee! Where art thou, Mother? Is it night? How black it is! Oh, am I blind?" And Naomi clung fast to her father and mother as if they must save her from this dreadful fate. "Blind!" thought her mother, remembering with a shudder the numberless figures that stretched pitiful hands by the Bethlehem roadside. "My little Naomi, blind?" "An amulet will cure her," said worried Samuel stoutly. "Be not downhearted, my little maid. Thy father will buy for thee an amulet that will open those brown eyes of thine wider than ever before." So Naomi wore about her neck for weeks a small three-cornered bag, in which was sewn a scrap of parchment taken from a religious book, written after certain rules and with a diagram so mysterious that not even Samuel could understand it. And how were the contents of this little three-cornered bag to restore Naomi's eyesight? Why, by charming away the wicked spirit who had cast an evil eye upon her. Or perhaps Naomi had chanced to rub her eyes upon waking before she had washed her hands. Being unclean, the devil present had slipped from her fingers into her eyes, and now must be charmed out again by the holy words about her neck. Not a thought that Naomi, daily handling sick little Three Legs, might have caught the malady that first darkened the vision of the poor little animal, and then[Pg 65] caused the frail life to flicker out altogether. Naomi missed her pet sorely, but its death was only one more grief added to the burden that overshadowed all her days. She could no longer play in the garden. Her well, begun so happily, was neglected, though not forgotten, and little Jonas was the leader now, guiding her faltering steps with such good-will that Naomi forgave him when he led her straight into the orange-tree or neglected to warn her that the myrtle bush was in her path. Her friends Rachel and Rebekah had deserted her, for at the first mention of the evil eye they had looked askance, and now they never came to play nor to entertain her with their talk. Little lame Enoch proved a faithful friend, and Naomi felt comfortable with[Pg 66] him as a playmate, for he, too, suffered from a handicap and yet was cheerful and gay notwithstanding. He knew a host of stories told him by his old grandmother, and the long hours slipped away quickly while their little tongues chattered, though their hands and feet were pathetically still. But of all the comfort Naomi knew, apart from the love of her father and mother, the companionship of Ezra was the greatest. He amused her, he waited upon her, he revived her drooping spirits with his own high hopes and plans for her. "Thou shalt see again, Naomi," he would declare confidently. "All the cures have not been tried yet. Thou art not like the beggars by the roadside. Say not that again, or I will dip thee some day in the well behind the myrtle bush that thou wilt be digging ere long. Most of the wayside beggars are old men with not an[Pg 67] eyeball left, whilst thou, Naomi, art young, and thine eyes from without look as clear and strong as mine. Wait until my father has taken thee to the Pool of Bethesda! Have patience, Naomi! Thou shalt see again!" The Bethesda Pool lay in Jerusalem on the Temple mount, a stone's throw from the Sheep Gate of the Court of the Gentiles, where Naomi had lingered before the sheep-pens on the afternoon that now seemed so far away. Perhaps in these days we should say that the great pool contained a mineral spring, but in Naomi's time it was not doubted that an angel had wrought the cures that were told far and wide of this "well of healing." About it were always clustered the sick, the lame, the halt, and the blind, in the belief that when the angel troubled the waters the first to dip himself therein would be healed. So Samuel the weaver purposed to take Naomi thither, and, even while the little girl lay thinking long, long thoughts and wishing for daybreak, the moments slipped by, the Fourth Watch or Morning came, and Naomi's mother rose to prepare the meal so the travelers might have an early start. A stout little donkey, borrowed from the khan stable, carried Naomi and her father briskly over the familiar Jerusalem highway. The little girl remembered how happy she had been on her journey with Aunt Miriam and how all the world had seemed gay that morning. Then she recalled the "tap, tap, tap" of the blind men on the road, and she hid her face in her father's cloak and trembled. "O that the Angel of the Pool may open my eyes!" prayed Naomi. "O that the Angel of the Pool may open my eyes!" The Pool of Bethesda was a pretty[Pg 69] spot. About it had been built five porches, and in their shelter lay the sick and the withered, the lame and the blind, waiting for a chance to push their way in the moment the waters began to move. When Naomi and her father arrived, the pool lay still in the sunlight, so Samuel established himself close to the edge with his arm about Naomi, and fell into conversation with a professional letter-writer who sat, bearded and grave, with ink-horn fastened at his side. "Thy little maid has felt the hand of the Lord?" queried the letter-writer, looking compassionately at Naomi who stood picking with nervous fingers at her father's sleeve. Samuel nodded sadly. In a few words he told the story of Naomi's trouble. "She is indeed grievously afflicted," observed the letter-writer, shaking his gray head and uttering a sigh. "And my[Pg 70] friend here, whom I come to lift into the pool, has lain helpless upon his bed for eight and twenty years. O that the Messiah would come! 'Then the eyes of the blind shall be opened and the ears of the deaf shall be unstopped. Then shall the lame man leap as a hart and the tongue of the dumb shall sing.'" "Think you the Messiah will come shortly?" inquired Samuel. This was a burning question of the day. The desire for the coming of the Kingdom of God was a flame that was consuming the Jewish nation. The letter-writer tapped his forehead thoughtfully with a brown forefinger. "Thou knowest the saying of the Pharisees, that if all Israel could keep the Law perfectly for a single day, Messiah would come. As for me, I long with a mighty longing to see Israel restored, to be delivered from our enemies, and to have our sins forgiven." Naomi stirred restlessly. What did all this talk of a Messiah mean to her? Well enough for the grown folk to look forward to the coming of a Saviour. As for her, all she asked of all the world was that the Angel of the Bethesda Pool might come with healing in his wings and lay his cool fingers upon her closed eyes and open them again. "Perhaps I shall see Mother's face to-night," she thought. "And Ezra will be at the village gate waiting for me. He promised. And I am to wave my girdle at the first turn in the road if my eyes are opened. O Angel of the Pool, remember me, Naomi! Remember me here in the dark!" Naomi's father, who had never taken his eyes from the pool, leaned forward. "It moves, Naomi," he whispered. "The Angel comes, although we see him not. Be ready, for I must act quickly." The surface of the pool began to heave and swell, and at the precise moment that the water boiled up, Samuel bent over with Naomi in his arms and dipped her head under the water once, twice, three times! Dripping, sputtering, and crying, Naomi was placed upon her feet, while her father endeavored to wipe away the water that ran down into her neck and stained her little robe. "Dost thou see, Naomi?" asked Samuel with a tremble in his voice. "Open thine eyes and look! Dost thou see, my little pomegranate?" If the Angel of the Pool failed them, where should he turn for help? Naomi obediently opened her brown eyes and stared, sightless as ever, into her father's face. The Angel of the Pool had failed them! IT was the winter season in Palestine. In the darkness and despair that followed her trip to the Pool of Bethesda, Naomi had not cared what the weather might be. She had listened with indifference to the whistling, roaring wind-storm that had come suddenly one night in October telling the weather-wise that summer was over and the rainy season at hand. Huddled over the brazier of charcoal that smouldered under a rug in a shallow hole in the middle of the floor, Naomi had not heeded the wild dash of rain against the house nor its melancholy dripping in the deserted garden. Even the excitement of Ezra and Jonas over a slight fall of snow, the first either one had ever seen, had failed to rouse her. Samuel and his wife were troubled beyond words at this calamity that had come upon their child. Aunt Miriam and Simon were sympathetic, but could offer no advice. Ezra was at his wits' ends, for all his schemes and devices to amuse failed, and the hollow words of encouragement died upon his honest lips. Samuel, too, had a fresh worry of which Naomi knew nothing, and which, slight though it was in comparison with the little girl's misfortune, did not tend to make the daily life of the family more pleasant. "Aye, Samuel the weaver's child is blind," said the neighbors, wagging their heads in knowing fashion. "What sin hath he committed, think you, that this calamity befalls him? Truly the way of the transgressor is hard." "It may be that his wife is the sinner," was whispered about. "Or perhaps both." And little by little the village people[Pg 75] turned aside when they saw Samuel coming, and fewer and fewer were the friendly words said to Naomi's mother when she went patiently down to the fountain for her supply of water. Ezra felt himself more fortunate than the grown people, for at the first unkind word from his former friend, fat Solomon across the road, he had flown at him in a fury, and had shortly enjoyed the satisfaction of seeing his blubbering enemy lick the dust. "Mole, indeed!" shouted Ezra, doubling up his fists. "Thou wilt call my sister a blind mole, wilt thou? Thou serpent, feeding upon the dust! Thou snake! Rise not up or I will rub thy nose in the dirt again." So cautious Solomon, having learned his lesson well, was forced to content himself with calling names from behind the wall, which Ezra was prompt to answer with sticks and stones. No one was happy in the little household, and faces were sober and voices hushed as they went about their tasks, until one day Aunt Miriam called Ezra and whispered in his ear. His eyes opened wide and his face brightened, and for more than a week he neglected his friends, the shepherds, and spent all his spare time at the khan. Then, one afternoon, when the rain had ceased and the little olive leaves glistened in the cold bright light, Naomi's mother approached the forlorn little figure crouched in a corner and raised her to her feet. "Here is thy warm cloak, beloved," said she, coaxingly, laying her hand on the soft brown curls that seemed to hang limply now that Naomi never tossed them back with a proud little shake of the head. "Before the door stand thy aunt, thy father, and thy brother. They wait for[Pg 77] thee. And, little Naomi, there waits a surprise for thee also. Come and listen by the doorway." From behind the door Naomi heard an unfamiliar stamping, a running about, and Ezra's excited voice. "Be careful, Jonas," called Ezra sharply. "Wilt thou be stepped on? Stand from under. Naomi, where art thou? Mother! Oh, she comes! Aunt Miriam, Father, she comes!" Naomi's mother led out the white-faced little girl and Samuel took her gently by the hand. "A gift for thee, little Naomi," said he, smiling more happily than in many a long day, "from thy good Aunt Miriam. Put out thy hand and guess." Naomi stretched out a timid hand and touched a soft furry nose. "A donkey!" said Naomi. "To take me for a ride!" "Aye," burst out Ezra, his face shining with unselfish joy; "to take thee for a ride every day and everywhere. Up and down the hills and roundabout. We shall go everywhere together, thou and I." "Speak more plainly, Ezra," said Aunt Miriam, seeing the puzzled look upon his sister's face. "The donkey is thine, Naomi. Thy Uncle Simon and I have given it to thee. Ezra means that he will take thee riding upon it whenever and wherever thou wilt. No longer shalt thou lurk in the house with white cheeks from sunrise to sunrise. We shall have thee as rosy as a poppy again ere long." And her tender-hearted aunt first wiped her brimming eyes upon the corner of her veil, and then caught back Jonas by his leather pinafore from under the donkey's heels, where he seemed determined to meet with a speedy death. "Now the trick!" cried Ezra, who had[Pg 79] been hopping from foot to foot during his aunt's long speech. "Have I not been teaching him for more than a week? Say thy lesson well, little donkey! Stand here before him, Naomi!" Samuel placed Naomi in position. "Thy donkey's name, Naomi," went on Ezra, "is Michmash, because he comes from the town of that name. Now place thy hands upon the tips of his ears. Do not pinch or he will kick. I know." 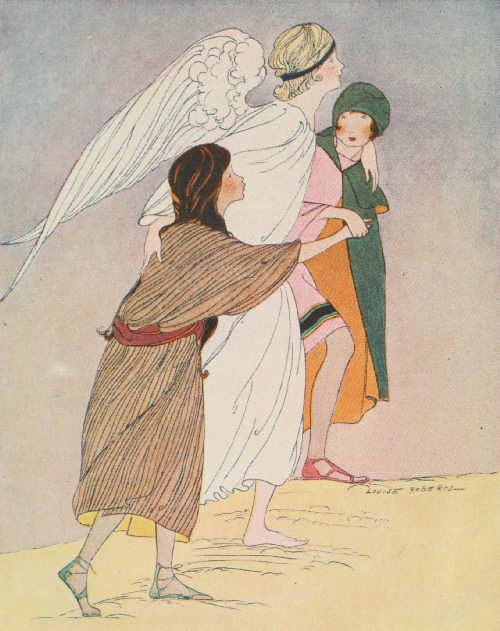 Samuel guided the little girl's hands until they rested upon the tips of the long gray ears. "Now say his name slowly," instructed Ezra, his face aglow. "Mich," said Naomi, and down came a furry ear, "mash," and down came the other. Then the little donkey winked both ears violently, and turned a patient eye upon his young teacher as if asking praise. "He did it! He did it!" cried the teacher. "He did not forget his lesson and he will do it every time. Michmash!" And as the long ears fell again, Ezra threw his arms about Naomi and hugged her close. "Wilt thou come for a ride with me now?" he whispered. "The sun shines and the wind blows and it will be pleasant out upon the hills." So seated upon the back of Michmash, Naomi rode off, with such a bright look upon her wan face that her father and mother could not help thinking that better days were in store for them all. Every pleasant day Ezra, leading Michmash, took Naomi, wrapped in her little scarlet cloak, out riding, and as they moved along in the crisp, bracing air they talked—long, long talks of what they were passing, of Ezra's day at school, or of the thoughts and fancies that filled Naomi's active little mind. "Ezra," said she one day, as Michmash felt his way securely up the side of one of the stony little Judean hills, "Ezra, dost thou remember what was told thee that the letter-writer said that day by the Pool of Bethesda?" Her lip trembled as she spoke, but Ezra answered her instantly. "Yea," said he, "I do, indeed. He spoke of the Messiah." "And what think you of the Messiah?" asked Naomi timidly. "What think you he will do when he cometh, Ezra? Dost think that he will open the eyes of the blind?" Ezra, in order to speak more earnestly, halted Michmash, who gladly fell to cropping the coarse grass. "The Messiah, Naomi," said Ezra slowly, "will do what the prophet Isaiah promised of him. Never fear. He will open the eyes of the blind and unstop the[Pg 82] ears of the deaf. He will make the lame man leap and the dumb man sing for joy. When he cometh, we shall all see the salvation of the Lord and our sins shall be forgiven us. All Israel shall rejoice. Aye, even stout Solomon also," added Ezra grimly. "The Kingdom of God will come, and the Messiah will rule in righteousness, and he shall put our enemies to flight. No longer then will we pay tribute to the Emperor Cæsar Augustus at Rome. No longer will we tolerate the wicked King Herod in our city of Jerusalem. And the Roman eagle that hangs above our Temple gates will be torn down and trampled under foot." Ezra spoke warmly. He had been well taught in school and synagogue, and had listened carefully to his father and his friends as they talked in the market-place and elsewhere. "Oh, I would that the Messiah would[Pg 83] come quickly," said Naomi wistfully. "And if he can make me see, he can make lame Enoch straight. I would that Enoch's old grandmother had not died and that he had not gone so far away to live as Jericho. I miss him." "Think now of this new numbering of all the world," went on Ezra, whose heart burned within him at the wrongs of his nation. "Every man must travel to the town whence his family sprang, whether he live near or far and whether or no he be rich enough to stand a journey. And why? Because the Emperor at Rome has ordered so. I stood in the market-place when the Roman heralds with their trumpets summoned all Bethlehem thither, and told of this new enrollment and of the taxing to follow. I saw the black looks and heard the muttering, but did any man speak out? Nay—afeard of the short sword the Roman soldier carries. Oh,[Pg 84] aye, I am afeard of it myself," admitted Ezra indulgently; "but when the Messiah cometh things will not be so." "Mother says that many have already traveled to Bethlehem to be enrolled," said Naomi, "and that we shall have a houseful when the caravan from Nazareth comes in. I would fain be a help to her just now and not a trouble, but I can do nothing at all, nothing, only keep out of the way." And the tears rolled down poor Naomi's cheeks. "Do not cry," said Ezra pitifully, and with a patience wonderful in a boy of his years. "We all love thee, Naomi, better than if thou hadst the sharp sight of an eagle. Come, greedy one," he went on, pulling at Michmash's bridle. "Wilt thou eat all night? Come!" They stood upon a hill that looked toward the north, and as Ezra waited for lazy little Michmash to finish his mouthful,[Pg 85] his eye caught a line of tiny black figures perhaps a mile away from Bethlehem village. "The caravan from Nazareth, I verily believe!" he exclaimed. "Hold fast, Naomi, and I will take thee down to the gate. There I will tell thee all the sights as they come in." Rattling over the stones and down the steep paths in reckless fashion, the little brother and sister were soon established in a spot where Ezra could see all that was needful, and whisper what he saw in Naomi's ear. "It is the caravan from Nazareth," he announced, "and they ride on horses, camels, mules, but some walk. There are great numbers of them and more are still to come. Some have fallen behind, they say, and are far back upon the road. They are very weary and they smile but little. Who would want to take the long[Pg 86] journey in winter only to part with money in the end?" When Ezra and Naomi reached home, they found that, as their mother had said, their house was full to overflowing with company from the Nazareth caravan. Abner and Joel, merchants of Nazareth, were there with Joel's son Amos and his wife Elisabeth. Samuel's cousin, Daniel, who owned a large farm in fruitful Galilee, had come, bringing with him as a matter of course his friends, David and Phineas, neighboring farmers. All these people had originally sprung from this city of David, and now back they came to it, some in good, some in ill humor, but to a man obeying the command of the Emperor at Rome. Every inch of floor space in Samuel's little house was occupied that night when the soft quilts were spread out, and the family and their guests lay down to rest. Naomi and Jonas were cuddled in a corner[Pg 87] next their mother. But when Ezra came in late from feeding Michmash, the dim light of the little oil lamp, that burned each night in all but the poorest of Jewish homes, showed him a floor so crowded with soundly sleeping guests that he knew not how to reach his own bed spread at his father's right hand. "My son," answered Samuel in a cautious voice. "Father, it is so crowded here I would fain spend the night with old Eli in the fields with the sheep. They are encamped below the khan in the Fields of David. May I go? Old Eli said but yesterday that I had neglected him of late." "Go, my son. Give greetings to old Eli, and God's peace attend thee." So Ezra slipped out under the dark starry sky to join the shepherds abiding in the field, keeping watch over their flock by night. EZRA picked his way carefully down the dark Bethlehem lanes until he reached the town gate, swung shut and locked hours before at sunset. "Nathan! Nathan!" he called, until the old gate-keeper peered out from his little booth and muttered a friendly greeting to the lad. "Nathan, I would go down into the fields with shepherd Eli to-night," explained Ezra politely. "Wilt thou not let me pass through the strait gate? Just this once! I will never ask thee again. Old Eli is thy friend and mine. Do the favor for him, I beg of thee, and I will bless thee all my days." Nathan could not help laughing at the old-fashioned speech of the boy. "Whether I do it for thee or for shepherd Eli, the deed is done," he cackled, and threw open the small gate standing beside the large one and known as the "strait" gate. "Ask me not again, I warn thee; ask me not again." Past the Bethlehem khan Ezra hurried, and down through the piece of fertile land that lay to the east, where the reapers of Boaz had swung their rude sickles and where Ruth had gleaned the golden sheaves. A walk of two miles brought him to the pasture land where the shepherd lad David had watched his father's sheep, battling with lion and bear when the need arose, and where, too, many of his sweetest songs had been written. The boy scurried along at a good pace, for on these dark and lonely roads to meet with wolf or jackal or, still more terrifying, with robbers, singly or in bands, was not unknown. At the end of the road Ezra peered about in the starlight until he could distinguish a number of dark forms huddled before one of the caves in the hillside. Within the shallow cave lay the flock asleep, and before it, on his rough bed of brushwood and rushes, sat shepherd Eli, with only a dog or two to keep him company. Beside him lay his shepherd's crook, his club tipped with iron the better to protect his charges, and his sling with which he was wont to throw stones just beyond his sheep to bring them back when they were going astray. Ezra chose to leap over the rude stone wall that enclosed this sheepfold instead of passing through the narrow gateway. The two great sheep dogs, gaunt and rough, who had spied him on the edge of the pasture land long before he had seen them, leaped fawning upon him with sharp yelps of affection. "Down! Down!" cried Ezra, half laughing, half impatient. "Eli, my father sends thee greeting. As for me, I would fain spend the night with thee here in the fields. I am crowded out of my father's house by visitors from Nazareth who come to be listed for the census. I will make myself useful, Eli. Perhaps thou canst steal a nap while I keep watch of the sheep. But why art thou alone to-night? Where are the other shepherds? And the dogs?" "Aye, aye," responded shepherd Eli, slowly wagging his head and drawing his sheepskin cloak about him. "Thou art always welcome, lad. As for sleep, never at cockcrow was I more wakeful than at this moment to-night. For there is something strange in the air, lad. The very dogs feel it. They lie quiet and still; they neither twist nor turn. Whether it be that friend or foe approaches, I know not. [Pg 92] Something beyond our ken is a-wing to-night." "But, Eli," said Ezra, "if it were wolves or jackals, the dogs would be barking. And where are the other shepherds? Wilt thou battle alone if the wild beasts come?" "Nay, child, nay," said Eli patiently. "I look not for wild beasts to-night, nor do the dogs expect their ancient enemy. Thou sayest truly, like a wise little shepherd, that they behave not thus when wolf or jackal is abroad. The other shepherds read not the signs as do I. Thieves lurk near at hand, say they, and with the dogs they go to rout them out." "What dost thou expect, Eli?" asked Ezra timidly. He was thrilled and frightened and thrilled in turn at this talk. The old man sat with his face turned to the brilliant Oriental sky powdered thick with stars. "'He numbereth the stars, He calleth them all by name,'" said Eli softly. "Expect? Child, I know not what I expect except that He who hath promised us salvation from our enemies and remission of our sins shall keep His holy word. And there are signs that the time draws near. Surely thou hast heard of the priest Zacharias, who was smitten dumb as he served in the Temple, and of the birth of his son John who, it is promised, is to go before the face of the Lord to make ready His ways. Who made the promise? Who but the Angel of the Lord, Gabriel, who stands in the presence of God. Think you his word shall fail? Nay, I tell thee the times are ripe." "But Eli—" Ezra began in his shrill little voice, when the old shepherd cut him short with a sudden gesture. "The men return," muttered Eli. "Once already to-night they have heard what[Pg 94] they term 'an old man's babbling.' Let us listen to their story now." "How many thieves caught ye, friends?" he called out. "Did ye surprise the enemy in his lair?" The shepherds filed in through the narrow opening and threw themselves heavily on the ground beside Eli and the lad. The dogs crouched low, with nose between paws, and closed their eyes. "Thieves? Nay," said one of the shepherds brusquely. "We saw naught amiss, and had but the walk for our pains." The shepherds wrapped their heavy woolen mantles about them and talked together in low voices. No one seemed disposed to sleep, though the day's work had been hard and all needed a night's rest. Ezra sat silent, thinking of old Eli's words and scarce hearing the conversation that went on about him. Suddenly the old shepherd grasped[Pg 95] Ezra's arm. One of the younger men was speaking. "The night has grown so still," said he. "Note ye that the wind dies down and that a hush falls o'er all?" His voice ended on a trembling note. He covered his face with his mantle and fell forward among his prostrate companions. Only old Eli, with his arm about shaking little Ezra, held his white head erect—joyous, confident, trustful. For an angel of the Lord stood by them, and the glory of the Lord shone round about them: and they were sore afraid. "Be not afraid; for behold, I bring you good tidings of great joy which shall be to all the people: for there is born to you this day in the city of David a Saviour, who is Christ the Lord. And this is the sign unto you: Ye shall find a babe[Pg 96] wrapped in swaddling clothes, and lying in a manger." On earth peace, good will toward men." Ezra, strengthened by Eli's arm which did not waver, ventured to open his eyes. He saw a brilliant whiteness, clear as crystal, that seemed to light the world from end to end. High above, the sky was filled with clouds of rose and amber and amethyst. All the glories of sunrise and of sunset were mingled there. Did he catch a flutter of white pinions? Did he glimpse a Leader, majestic, terrible, yet radiant with gracious love? Even as he stared, unable to move, the song grew fainter, the colors faded and vanished. The echo of the angels' song rang in his ears. To his dying day it would haunt his memory. The muffled figures on the ground stirred and stood erect. Overhead burned the stars in the frosty sky. The silence was broken by old Eli. "Let us now go even unto Bethlehem, and see this thing that is come to pass, which the Lord hath made known unto us." Over the rough, uneven ground hastened the shepherds. Their flocks for once were left uncared for, save by the dogs. They pressed on across the familiar pasture land, up and over the cornfields, and then took the sharp rise that would lead them past the Bethlehem inn. Clinging to the hillside and facing the cornfields was the stable of the inn, a[Pg 98] rough cave in the limestone rock. On a rope stretched across the wide entrance swung a lantern, whose dim light twinkled and flickered before the eyes of the shepherds as they came up the hill. Old Eli quickened his pace, Ezra at his heels. "And this is the sign unto you: Ye shall find a babe wrapped in swaddling clothes, and lying in a manger." The boy knew that the inn was crowded to overflowing, as was his own and every house in Bethlehem that night. Was it possible that this familiar manger was the resting-place to-night of a Heavenly Guest? Were strangers lodged in the stable? Was this the only shelter that could be offered the latest arrivals of the Nazareth caravan because there was no room at the inn? At the stable entrance Ezra hung back. He saw a man come forward out[Pg 99] of the shadows and talk with Eli. With a single gesture the old shepherd motioned his companions to join him. Lost for a moment in the gloom, Ezra saw them again speaking, bending forward, then falling upon their knees. The stars had faded and an early morning wind was blowing chill when at last the shepherds made their way out of the stable. The lamp, still swinging, burned pale in the dawn, but its faint light fell across the white face of a little boy who lurked in the doorway and whose cold hand clutched old Eli as he came exulting forth. "Praise God! Praise God for His mercy, justice, and truth! Praise—"
Old Eli started at the cold touch, and looked down with eyes that glowed with an inward light. "Child, what doest thou here? Hinder me not. I go now to spread the[Pg 100] good tidings—to praise and to glorify God." Ezra opened his dry lips. "Hast found Him?" he asked. "Is it the Messiah? Is it the Christ?" "Aye, child, 'tis as the angel said," answered Eli happily; "a babe wrapped in swaddling clothes, lying in a manger. Come to bring peace on earth, our Saviour who is Christ the Lord, our long-looked-for Messiah! Glory to God in the highest! Glory!" Ezra heard no more. He had turned, and with the speed of an arrow from its bow was running up the steep road toward home. THE rising sun pushed through a bank of purple cloud and touched with long rosy beams the roof of Samuel the weaver's house. On the narrow parapet that bordered the roof walked a number of snowy pigeons, stepping delicately with heads raised and thrown back as if to enjoy the splendor and freshness of the early morning. In one corner of the roof lay a dark heap, heedless of sunlight, morning breeze, or bird, conscious only of the blackest misery, the deepest hopelessness that an eight-year-old heart can know. It was Naomi, who lay with hands clenched and face pressed against the cold stone, too heartsick for tears, wishing only[Pg 102] in her wretchedness to creep away where she might be alone. Presently she stirred and lifted her head. Quite a different Naomi was this from the happy, generous child who had sacrificed her flower garden for the sake of an ailing lamb; not at all like the little girl who had set forth so joyfully for a day's pleasure in Jerusalem. Her little robe was wrinkled, her curls were tangled and rough, her face was pinched and pitiful. With her soft little fist she beat upon the roof in time with the rhythm of her words. "Did they think I could not hear?" she asked, speaking aloud in her fullness of heart. "Did Elisabeth, the wife of Amos, think that I was deaf as well as blind that she should say aloud, 'The child Naomi will never see again. There is no hope.'" "No hope! No hope! And perhaps I shall live to be as old as lame Enoch's grandmother lived to be. Who will care for me then? Who will give me shelter and food? Amos of Nazareth thought of that, too. I heard him, though he whispered low. 'She will be always a burden. It were better that she should die.' I heard him. He said those words. 'She will be always a burden. It were better that she should die.'" "Die? Die? I cannot die. I am well and strong. I shall live and live and live. My mother and father will die and leave me, and Ezra and Jonas will weary of me. I shall be a beggar by the roadside. No hope! No hope!" Naomi sank down again in a little heap and rocked to and fro. Her misfortune seemed too dreadful to be borne. It was incredible that such a fate should overtake her. It might happen to Rachel, or[Pg 104] Rebekah, or to stout Solomon across the road, but not to Naomi, the daughter of Samuel the weaver. As she swayed back and forth, torn by her misery, there came to her, like balm upon a wound, the familiar, comforting words that her mother and father had used over and over of late, to soothe the little girl's pain and to encourage hope in the sad hearts of them all. Yea, wait thou for Jehovah." Naomi rose to her feet. The startled pigeons withdrew a short way and stood watching her curiously with their hard, bright eyes. About her was the soft sunlight, over her head the deep blue sky. She turned her sightless face toward[Pg 105] Jerusalem and spoke as if to a friend present. "Yea, Lord," said the little Jewish girl in simple faith, "I will wait for Thee, and for Thy Messiah who will open the eyes of the blind. Surely when Messiah cometh I shall see. And until then, I will wait and pray for His coming. I will wait." On the outer stairway that led from the ground to the roof stood Ezra, breathless, his hand pressed against his side. He had run all the way, without stopping, up the steep lanes from the Bethlehem stable, and now, pausing to rest an instant before speaking to Naomi, he could not help overhearing the last words she said. "So thou wilt wait?" he whispered, his breath coming in gasps. "Thou wilt wait for His coming? Nay, my little sister, thy time of waiting is over. The Messiah is here! The Christ is born! O that[Pg 106] I might shout it from the housetop, that my father and mother and all the world may know that the Lord hath kept His promise and the Messiah hath come!" Ezra's whole heart and soul were full of a great new hope, and the sight of Naomi's tear-stained face and groping, outstretched hands made him long to tell her the good tidings at once. But the boy's love for his unhappy little sister made him wise beyond his years. "If I tell her, and it does not come to pass as she wishes, it will break her heart," he argued. "The Messiah is but a tiny Baby now, weak and helpless. It may be He must grow to manhood before He can heal the blind, the deaf, and the sick. Who knows? Not I. I will not tell her yet." "Naomi! Naomi! Where art thou? Oh, here thou art! Are thy sandals well tied? For I have come to take thee down to the inn stable to show thee something there. And what it is, thou couldst never guess if thou didst guess a hundred years." "Show me? What could I see? Nay, I will go nowhere, Ezra," she answered sadly. "If I went, I could not see thy wondrous sight. I would far rather stay at home." "But this is something to feel," said Ezra coaxingly, putting his arm about Naomi and leading her gently toward the stairway. "Tell me, dost thou remember when young Deborah, the vine-dresser's wife, laid something soft and warm in thine arms?" "A baby, Ezra?" asked Naomi, stopping short. "A baby at the inn stable?" "Aye," said Ezra firmly, "a Baby! A Baby born in a stable and lying in a manger because there was no room last night at the inn." "But I cannot see it, Ezra," said Naomi mournfully. "Why should I go? I cannot see." "Dost thou remember, too, how Deborah's baby clung to thy finger?" said the crafty Ezra, guiding her tenderly down the steps as he talked. "And did ye not find it pleasant to hold? You rocked it to and fro all day long, Naomi. You said that you wished that Jonas might be put back in swaddling clothes again." "Aye, it was pleasant," admitted Naomi. "But Deborah brought the baby to me. I will not go to the khan, Ezra. I do not wish to meet any one. My heart is heavy. There will be people to stare at me and to talk in the lanes and at the stable. I will not go." "Naomi," said Ezra desperately, "dost thou love me?" "Aye, thou knowest that I love thee," answered Naomi in surprise. "Then, to please me, come to the inn stable," was Ezra's quick response. "Ask me no questions and delay not, but come. It is early, Naomi. We will meet no one, I hope and trust. Give me thy hand and come." Naomi instantly slipped a thin little hand into her brother's outstretched palm. "For love of thee, Ezra," said she sweetly. "For love of thee." Down the quiet road, deserted in the winter season at this early hour, Ezra led Naomi, carefully guiding her over the stones and ruts in the rough highway. Unobserved, they slipped quietly through the town gate, and when a turn in the road brought the khan into view Ezra threw his arm about his sister and quickened their steps. "One of thy pigeons flies before us, Naomi," said he, "as if to lead us on. It glistens in the sun like silver." Naomi only nodded and clung the tighter to Ezra's arm. Past the inn and round to the stable door he led her, and there they halted. "Naomi," said Ezra, his voice trembling with hope and fear, "thou knowest the stable well. Enter, and walk forward until thy feet touch the straw before the manger. There lies the Babe!" With a gentle push Ezra started Naomi toward the Mother and Child, whose figures he could dimly see on a heap of straw at the back of the cave. Then in the shadow of the doorway Ezra fell upon his knees. "O Lord," he prayed, "I know that this is Thy Messiah. I believe that Thou hast sent Him. Thou hast promised of old[Pg 111] that when Messiah cometh He shall open the eyes of the blind. I would that He might open my sister Naomi's eyes. If Thou wilt answer this prayer, Lord, I will promise Thee anything. I will be Thy faithful servant, I will be an obedient son, I will learn my lessons well at school and never shirk. I will no more throw stones at stout Solomon nor even call him names. I will promise anything Thou mayst ask of me, if Thy Messiah will only open my sister Naomi's eyes. Hear my prayer, O Lord, hear my prayer." Within the stable Naomi crept cautiously forward. Her footsteps lagged, for she had no heart in this undertaking. What pleasure could there be for her in visiting a stranger's baby which she could not even see? A short time ago, to hold the soft little body close and to feel the tiny clinging hands might have given her a moment's happiness; but to-day[Pg 112] her heart was so full of misery that there was no room in it for joy to enter. She longed to sink down on the stable floor. Only her love for Ezra kept her moving. She felt the straw before the manger beneath her feet, and she dropped to her knees and stretched out a timid hand. Yes, the Mother and Child were before her. She fingered the hem of the cloak wrapped about the young Mother, but she could not bring herself to touch the little Child. "I care not! I care not!" thought Naomi hopelessly. "What to me is this Baby? Why should Ezra wish me to visit this Child?" As if in answer to her unspoken question, with a sudden lovely gesture, the Child leaned forward. His tiny fingers touched Naomi's forehead and His hands[Pg 113] rested for an instant upon her darkened eyes. Naomi opened and closed her eyes rapidly. She rose to her feet and stared about her. Was it a dream, the same kind of a dream with which she had so often lightened the weary hours of darkness, the long watches of the night, when she had called to mind some old familiar scene—her mother at the well, the country road, Ezra hastening home from school? Now the inn stable rose before her. Did she really see the nose of an ox thrusting itself over the stall? Or did she only dream the mound of hay, and on it the young Mother wrapped in a wide blue cloak and in her arms a Child, at the velvet touch of Whose tiny hands the black curtain had dropped from before her eyes? Naomi rubbed her hands together and[Pg 114] looked down at them. Yes, they were her own hands. There was the familiar little brown spot on the inside of her third finger. Her dress? Yes, that was an old friend, the yellow and red striped robe. She had worn it the day in the garden that she had given her four scarlet poppies in exchange for little Three Legs. Then it was true! She did see. But how had it happened? Why at the touch of this Baby hand had her sight been restored? "Ezra!" she called, not daring to stir. "Ezra!" Ezra's face, white under the tan, showed itself round the stable door. "Ezra," cried Naomi, "I can see! I can see! I know not how it is, but I was blind and now I see! O Ezra, the Baby touched me and I can see!" Ezra came swiftly forward. His eyes were full of tears, but his face was radiant. [Pg 115] He knelt before the Mother, who was watching the scene with wondering eyes, and the Child, Who slept now in His Mother's arms. He pulled Naomi down beside him. "Naomi, it is the Christ Child," he whispered. "The Messiah has come! Our Saviour lies before us! O Naomi, the Messiah hath opened the eyes of the blind! The Lord hath heard my prayer!" And bending low before Him, they worshiped at the Christ Child's feet. THE household of Samuel the weaver lay sleeping soundly. The dim light of the small oil lamp revealed the figures of Samuel and his wife wrapped in heavy slumber, with Jonas, rolled into a plump little ball, at his mother's feet. Naomi lay close by with arms outstretched. Her dreams were pleasant, for her lips were parted in a smile. Ezra was missing. He was again spending the night in the fields with shepherd Eli. The friendship between the old man and the lad had grown more deep and strong since the night of the Angels' Visit, and they never wearied of discussing the wonderful event and all the marvels that had followed in its train. These happenings had roused all the village of Bethlehem, and had now touched[Pg 117] even the city of Jerusalem since the appearance of the Wise Men from the East, who, following His star, had come to worship the King of the Jews. That very evening Ezra and Naomi, caught on a lonely hillside by the sudden fall of night, had with one accord pointed to the dusky road below, along which rocked noiselessly three tall camels bearing the Magi rapidly in the direction of Arabia. "They brought gold and frankincense and myrrh," murmured Ezra, "the offerings to a king." "Aye, to my King, to my Messiah," answered Naomi happily. "Oh, Ezra, I would that I had all the gold and frankincense and myrrh in all the world that I might lay it at His feet. How can the neighbors doubt when they see what He has done for me? Who but the true Messiah could open my eyes and give me sight again?" "Many do believe, Naomi," he answered. "And all thy life now thou canst be a living witness to God's mercy and love. How happy He has made us all! Father and Mother, thou and I!" "And Jonas, too," said Naomi quickly. "He laughs and plays with me now as never before. He knew that something was wrong, though he could not put it into words. We are to begin again to dig our well to-morrow, he and I. I promised him." It may be that Naomi's dreams that night were of this pleasant task that awaited her; it may be that in her sleep, as in her waking hours, her thoughts were filled with visions of the Christ Child even as her heart was full of love for Him. Her smile deepened, and she did not stir as the night wore on. The stars were growing pale, though[Pg 119] morning was still far off, when the deep silence of the village was broken by the sound of feet running lightly, cautiously, up the lane. Nearer and nearer came the footsteps until they halted before the door of Samuel's house, and a little figure, panting and breathless, stepped quickly within. Naomi sat upright and peered sleepily through the gloom. "Ezra, is it thou?" she asked in surprise. "Is it morning yet? What brings thee here?" "I have news, Naomi, bad news, I fear," the boy answered. "I must waken my father and mother. Whatever is done must be done quickly. There is no time to lose." "I hear thee, son," said Samuel's voice unexpectedly. "What is thy tale?" "And my mother?" questioned Ezra. "It concerns Jonas." "I sleep not," said Jonas's mother, broad awake in an instant, and drawing the drowsy little ball into her arms in swift alarm. "Tell thy story quickly." "As ye know," began the boy hurriedly, "I went down to the Fields of David at sunset to spend the night with shepherd Eli. And as I passed through the gate old Nathan hailed me. He told me that one of the shepherds had borrowed his warm cloak and had not yet returned it, and that he was now full of aches and pains and sorrows because of the lack of it. He charged me straitly to tell the shepherd to return it at once or he would have him haled before the magistrate at daybreak, and that he would not cease his watch for it nor sleep that night until the cloak was round his shoulders once again. "When I reached the Fields, I gave his message, but the shepherd who had[Pg 121] taken his cloak was not there; he had gone in search of a lost lamb. And when, less than an hour ago, he returned, he asked me to keep him company to the gateway, and help him make his peace with angry Nathan. They know that Nathan is friendly to me," added the boy in explanation. "And I know that some night, wandering about as thou dost, thou wilt be caught by beast or robber," growled Samuel. "Resume thy story." "He spoke no more," Ezra went on, "but I said unto him, 'My little brother, think you there is danger for him?' He nodded in reply, and then I asked, 'Start you at once?' He nodded again and stepped back into the shadow. "At the gateway old Nathan, glad to see his cloak again, let me through, and I hastened home to tell the tale to thee." Ezra's mother had already arisen and, opening the great carved chest, had taken from it warm wrappings in which she was bundling the still sleeping Jonas. "Deborah, the vine-dresser's wife, leaves at sunrise in the caravan for Joppa." As she spoke, she worked busily gathering Jonas's little garments into a bundle. "For friendship's sake she will[Pg 123] take Jonas with her. We have, in her, at least one true friend in Bethlehem. Her mother lies at Joppa sore stricken with a fever, and it may be that our boy will take the sickness and perchance will die. But rather would I see him in his baby grave than in the clutch of cruel King Herod." "I will go with thee, wife, to carry the child," said Samuel gravely, seeing that her simple preparations were now finished. "Give thy brother a kiss in farewell, children. It may be thou wilt never see him more." As Naomi stood on tiptoe and pressed a tender kiss upon Jonas's plump cheek, he suddenly opened his dark eyes and, at sight of his sister, broke into a broad smile. "Farewell, Jonas, farewell," whispered Naomi, her eyes full of tears. "When thou returnest we will dig the well behind[Pg 124] the myrtle bush, thou and I. Farewell!" Then she laid her hand upon her father's arm. "Father," said she in a low voice, "the little Messiah also traveleth far to-night. I owe to Him my sight and the happiness of us all. I would fain give unto Him a gift. I would that I might give unto Him my little Michmash, that He may be borne swiftly and surely on the long road that He must go." Samuel looked for an instant into the brown eyes upturned to his own. He remembered the darkness, the suffering, the vain hope, the despair, then—blessed be Jehovah! the Light that had appeared and that had so wondrously shone into the life of his little maid. "Yea, child," said he warmly. "No gift that thou couldst give would be too great." "Ezra," cried Naomi, "canst thou overtake them, think you?" But Ezra had already left the room, and could be heard in the shed behind the house fitting the bridle over the astonished Michmash's head. Naomi caught up her little scarlet cloak from out the carven chest, and as Ezra came past the door, leading the little gray donkey, she flung it across her brother's arm. "The journey down into Egypt is far, and the night winds are cold. It may be my scarlet cloak will keep the little Messiah warm." She threw her arms about her donkey's neck and laid her cheek against his soft furry nose. "Fare thee well, little Michmash," she whispered. "Stumble not nor falter on the way. Thou carriest the Light of all the world, the Hope of every heart upon thy back. Farewell, farewell!" Sunrise—and again Naomi stood alone[Pg 126] upon the housetop. Her night of darkness behind her, she turned her happy gaze upon the morning sky, blue and rose and violet, whose clouds touched to misty purple the hilltops and the peaks that surrounded Bethlehem village. Below her lay the white stone houses, a few steep fields of dark ruddy loam, the sloping gardens with their vines, their fig and olive trees. From where Naomi stood the road that led to the Holy City was hidden from view by the mountain peak Mar Elias, and as she looked toward it her face lighted and she clasped her hands before her. For on the mountain-top rested two great clouds like angels' wings, and with a heart full of awe and reverence and love little Naomi felt that she stood in the very presence of Jehovah God. What though the promised Messiah[Pg 127] was fleeing secretly and in dread from His own country? The Lord was mindful of His own, and was even now keeping watch over His people. "Behold, He that keepeth Israel will neither slumber nor sleep." She had no words. She could only stand and let the tide of love she felt sweep over her again and again, until softly and almost imperceptibly the Heavenly Pinions faded away into the blue. When Ezra came he found Naomi looking toward the road that wound ribbon-like past the Bethlehem inn down into the land of the Pharaohs, the country of the Sphinx and the Pyramids. He nodded at the question in her eyes and silently pointed out to her a little group that moved steadily forward upon the dusty road below. "Dost see them?" asked Ezra softly. "Joseph, staff in hand, leads little Michmash[Pg 128] who bears the Mother and the Child upon his back. He steps forth bravely, the little beast. Ah! now they take the turn that hides them from our sight. Our little Messiah! Gone from us after so short a time!" "Aye, but to come again," said Naomi confidently. "I know it, Ezra. I was blind and now I see. As a tiny Babe He brought the light to me alone. But when He comes again, He will be the Light of all the world, Ezra, the Light of all the world."